Yevgeny Salinder, 11, found the remains of a woolly mammoth on Sopochnaya Karga cape in Russia’s northernmost peninsula of Taymyr. It is the best preserved mammoth find in a century. The mammoth was taken to Dudinka, the capital of Taymyr peninsula, the northernmost part of mainland Eurasia. The remains were discovered 3 km from Sopkarga polar meteorological station, where the boy lives with his family. Zhenya told his parents about his find, and they in turn informed scientific experts. “Despite the fact that it is not common in scientific circles to name the adult remains of ancient animals, this mammoth was called Zhenya – after the Nenets boy who first found the mammoth. Officially the animal will be known as the Sopkarginsky mammoth,” said deputy head of Zoology institute in the Russian Academy of Sciences, Russian Academy of Sciences secretary Alexei Tikhonov. The total weight of the remains is more than 500 kg, and that includes the right half of the body with soft tissue, skin and hair, scull with one ear, a tusk, various bones and even reproductive organs, the Dolgano-Nentsky administration website announced. The body found in Taymyr tundra is male and died at the age of 15-16 approximately 30,000 years ago. It took the scientists a week to extract the frozen remains, using axes, picks and steam. There have been no finds this big and with such well-preserved tissue since 1901, when another mammoth was discovered near Beryozovka River in Yakutia. It is the second best-preserved mammoth body in the entire history of paleontology. The mammoth was taken to Dudinka in a helicopter and was put in an ice chamber there. Now all the necessary paperwork will need to be completed with the local administration and the remains will be studied by leading paleontologists from Moscow and St. Petersburg. Even the first look showed scientists that the mammoth’s hump is comprised of fat, like that of a camel, and is not a result of the skeletal structure. 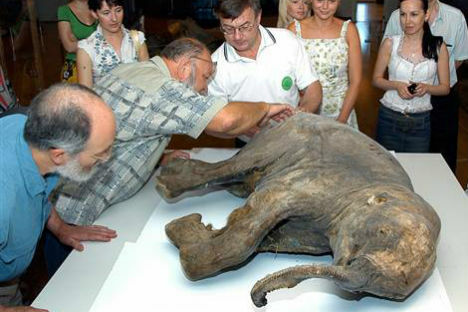 After the remains are studied, Zhenya the mammoth will move to Taymyr natural history museum as a showpiece. It has been previously reported that Russian Academy of Sciences planned to clone a mammoth together with Japanese Kinki University, where scientists have been working on cloning pre-historic animals for 15 years. The scientists could use Indian elephants as a basis instead of African, because their DNA is the closest to mammoths. It is not yet clear whether this find will in any way affect the plans.